Insurance companies can only offer attractive premiums if they are able to control the costs of damage events. Suncycle helps insurance companies settle claims from the evaluation through to the adjustment. Our experience shows that commissioning an authorised test centre already limits the amount and frequency of damage events. In case of damage Suncycle carries out the assessor’s evaluation as well as the execution of the repair works. Significant costs can be saved here if a component’s full output can be restored by simple and low-cost repair methods. Savings are also possible if the damaged components are returned and reconditioned. 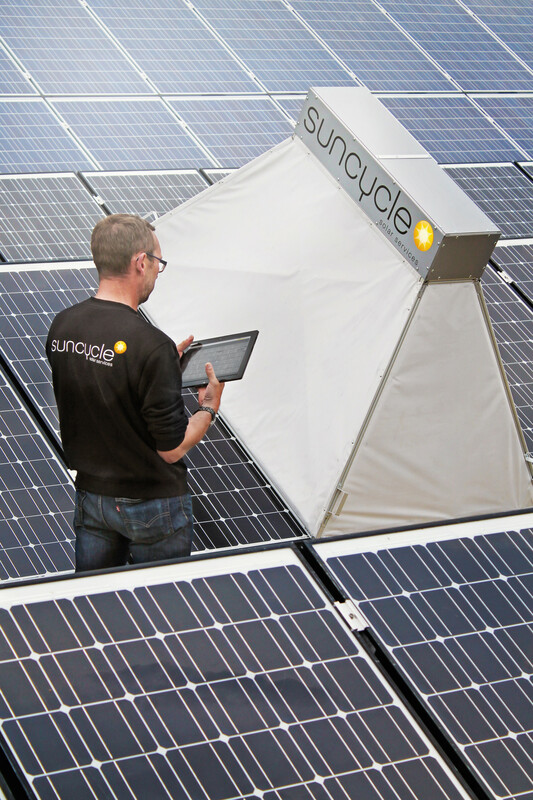 Suncycle has established an “Excellence Centre for PV Damage” especially for insurance companies that are active in this segment. Our customers can cut costs through the optimised settlement of claims, thus making it much easier to calculate premiums. Suncycle offers insurances end-to-end claim handling. This encompasses the damage assessment, the advise for appropriate test and repair efforts including the needed work and the recycling and/or sale of the refurbished components. Examination of third party cost estimates are also part of our standardized service offering. Please ask for our attractive rates under easy to use frame contract conditions with fixed delivery scope. In close cooperation with insurances Suncycle provides loss adjustment of large claims – following natural desasters like floods or heavy storms. With our own Suncycle installation teams and our service partner network we are able to manage large projects centrally in a short time. For the insurance administrative expenses can be minimized and a transparent and cost opimized adjustment is guaranteed. Not always the entire PV system has to be replaced. Often only single modules, inverters or parts of the substructure are damaged. With innovative testing methods and mobile laboratories the damaged parts can be identified on-site and extra handling be minimized. Costs are significantly reduced and client satisfaction improved. To reduce the cost of loss adjustment Suncycle examines each individual component of a replaced PV system on its continued operation. Components which can be refurbished with acceptable effort are sold on the secondary market and the earnings reduce the overall claim costs. Suncycle works closely with SecondSol as a sales plattform for used components.